I have quite a few garments from this lovely shop that I've used quite a lot in my performances. The Dark Angel is an international company that ships world wide exquisite fairytale clothing for women, men and children. It also keeps a regular "bargain or best offers" section which is reason alone to bookmark it. Beside the models listed they also have a couture line that you can ask about for special events like weddings or prom balls. They are actually increasing catalog and working on new models and I'm yearning for their new red "Avalon dress" and the red gothic fairy dress made also in ivory. But for men they keep also a wide range of lovely coats capes and shirts, to give that vampire, poet, or pirate look. As it names suggests The Dark Angel has a spice of Dark into it, and many of the models would switch perfectly that "Interview with a vampire" look. Below I show some pics of the garments from them I already own and use for my own performances. Of course they look much better on the model than in me, but still i was so happy to give them use on stage and some photoshoots, Dark angel are very comfortable, even their corsets will not really cinch your waist but put things in proper place and very wearable. My advice is to get even if they are made the actual size, always a size a little smaller than your actual one as they tend to be loose (most of then have though laces or straps to make them adjustable). 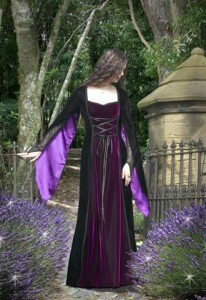 I have the three gowns posted above, and a few corsets as well but be sure to check the rest of their shop. The white fantasia dress has a lot of fabric and feels heavy in a lovely way and you can see me in a you tube video performing with it here. The damselle dress is a rather simple medieval mood garment but fits like a glove, will make you feel slender, it has really a gracious shape. 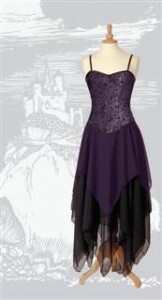 Below you can see a picture of myself in a photo shoot with the Purple gothic fairy dress that you can watch above. Submitted by on 2008, July 7 - 15:15. Submitted by Sarah on 2008, December 13 - 11:51.